Two instrumentals highlight 'Heera Panna'. The first is groovy easy-funk featuring wordless vocals from Usha Iyer/Uthup (I'm guessing) Annette Pinto, the second is no holds barred psych-jazz with a relentless conga beat, screaming moogs and a whole lotta noise; tribal, raw, and brilliant. While quite a few Bollywood instrumentals of the era sounded like freak-out music, this is the only one I'm aware of actually called that. The songs are good too, most of them. My favourite is 'Bahot Door Chale Jana Hai', from the exotica-tinged underscoring of the dialogue part to the sweet melody. And the intro to 'Panna Ki Tammana' (not included in the video) is fabulous. Back with a real beauty ! Thanks for this, and all the other stuff i've been downloading from you. It's terrific! Hey PC, i was just wondering if you recognized what Bollywood soundtrack this clip is from...been trying to find it for a while. Thanks a lot if you can check it! Indeed a rocking comeback ! 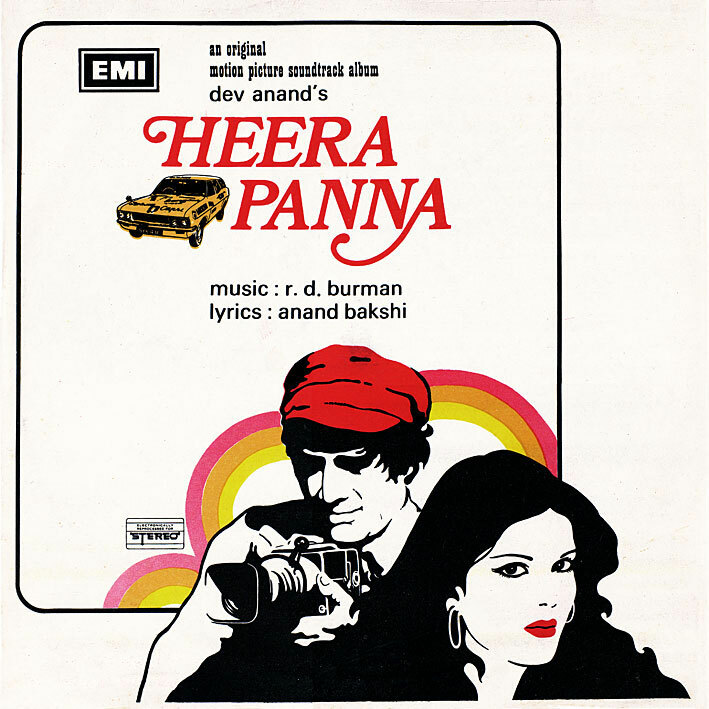 HEERA PANNA from the house of Burman. Another of his Hippie influenced, psychedelic era movie. Great movie and greater soundtrack. How can I ever repay you for all this wonderful music. Thanks once again. Joe: Doesn't ring a bell, but maybe someone else here might recognise it (someone usually does). thanks bud and welcome back! I'd put money on it not sounding any better though, they never do. I'm sure it's available to torrent from somewhere. Wow, great one! I really dig both of the instrumentals, I've heard all the songs before but never these two tracks, and they're both awesome. I think it may be Annette Pinto providing the vocals on the theme music though, RD used her occasionally for these types of crooning tracks or songs which required Anglicized vocals. Usha's voice probably would've sounded much deeper. Maybe someone can confirm. I am not sure bout how u got this unique and proprietory idea.But this is just gr8 in terms of sound quality and walking down the vinyl memory lane. 1. will u be uploading more such RDB songs ripped from vinyl? 2. do u have songs (vinyl ripped)from Azad (Dharmendra),Nikamma,Khatta Metha (Rajesh Roshan),Amne Samne etc from Polydor? Appreciate a response.Thnx once again. Sorry for the late response; been away for a bit. There will definitely be a few more RDBs in the coming months. I don't have any of the titles you mention though. hi...one request...i lost my laptop...thus trying to collect back some of my favorite...is it possible to share this album?